When I went to view this month’s challenge, I once again found myself feeling intimidated by the process that lay ahead of me. I have to say here that being a part of Daring Bakers is really starting to build my confidence in the kitchen and making me realize that I am capable of far more that I ever imagined. It has taken me out of my comfort zone big time, but even though they have planted me in foreign territory Daring Bakers has made me realize that I can accomplish these projects and there’s nothing to be intimidated by. Daring Bakers is also opening me up to these new and fabulous creations! This month is no exception. This month for Daring Bakers we were challenged to try our hand at making povitica (pronounced po-va-teet-sa) which up until this challenge, I had never even heard of before. 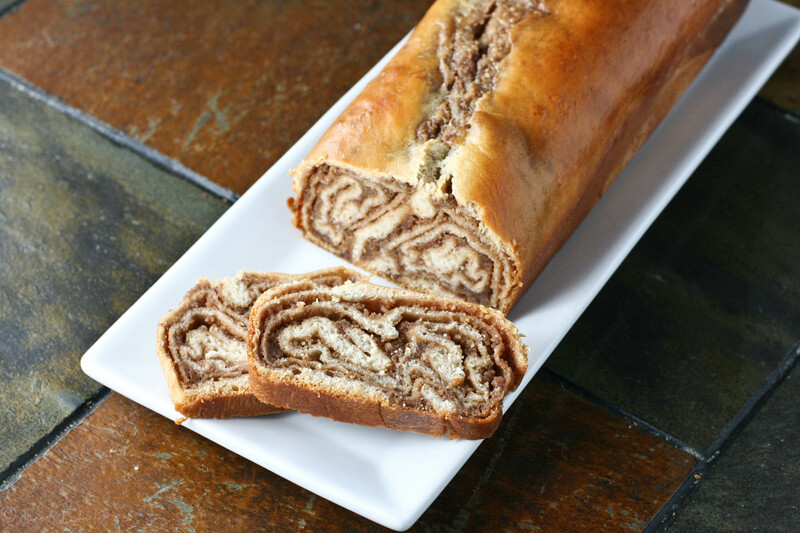 Povitica is traditional Eastern European dessert bread that is traditionally served during the holiday season. It is also known as Nutroll, Potica, Kalachi, Strudia, just to name a few. Family recipes, and the secrets on how to roll the bread so thin, were passed down through generations of families. However, the tradition of baking this type of bread has become somewhat of a dying art form so our hostess this month, Jenni of The Gingered Whisk thought it would be a wonderful opportunity for us to learn to make this wonderful sweet bread. In fact, she created this recipe all herself! This sweet bread weighs in at a whopping 2 1/2 pounds per loaf! Traditionally, povitica is swirled with a cinnamon walnut filling that when sliced appears as delicate swirls throughout the bread. It’s really quite beautiful. I also made a loaf with a cinnamon apple filling. You can also try filling it with other fruits or even a sweetened cheese filling. The possibilities are endless. So as you read this recipe, keep in mind it’s lengthy however that’s because it’s detailed. The process was not difficult and the result was one of my very favorite things I’ve baked to date. The Daring Baker’s October 2011 challenge was Povitica, hosted by Jenni of The Gingered Whisk. 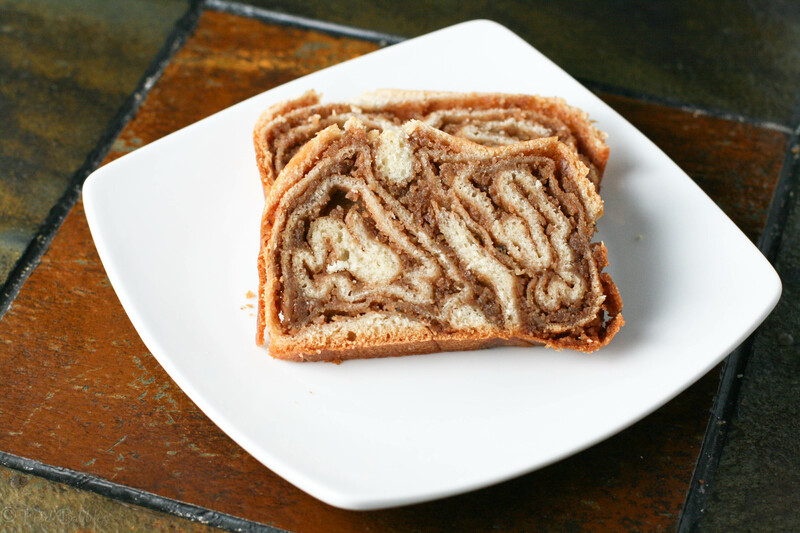 Povitica is a traditional Eastern European Dessert Bread that is as lovely to look at as it is to eat! – In a medium saucepan, heat the milk up to just below boiling (about 180°F/82°C), stirring constantly so that a film does not form on the top of the milk. You want it hot enough to scald you, but not boiling. Allow to cool slightly, until it is about 110°F/43°C. – In a large bowl, mix the scalded milk, ¾ cup (180 gm/170 gm/6 oz) sugar, and the salt until combined. – Add the beaten eggs, yeast mixture, melted butter, and 2 cups (480 ml/280 gm/10 oz) of flour. – Blend thoroughly and slowly add remaining flour, mixing well until the dough starts to clean the bowl. – Turn dough out onto floured surface and knead, gradually adding flour a little at a time, until smooth and does not stick. – Place dough in 2 lightly oiled bowls, cover loosely with a layer of plastic wrap and then a kitchen towel and let rise an hour and a half in a warm place, until doubled in size. – In a large bowl mix together the ground walnuts, sugar, cinnamon and cocoa. – Heat the milk and butter to boiling. – Pour the liquid over the nut/sugar mixture. – Add the eggs and vanilla and mix thoroughly. – Allow to stand at room temperature until ready to be spread on the dough. – If the mixture thickens, add a small amount of warm milk. – Spread a clean sheet or cloth over your entire table so that it is covered. – Place the dough on the sheet and roll the dough out with a rolling pin, starting in the middle and working your way out, until it measures roughly 10-12 inches (25½ cm by 30½ cm) in diameter. – Spoon 1 to 1.5 teaspoons (5ml to 7 ½ ml/4 gm to 7 gm) of melted butter on top. – Using the tops of your hands, stretch dough out from the center until the dough is thin and uniformly opaque. You can also use your rolling pin, if you prefer. – As you work, continually pick up the dough from the table, not only to help in stretching it out, but also to make sure that it isn’t sticking. – When you think it the dough is thin enough, try to get it a little thinner. It should be so thin that you can see the color and perhaps the pattern of the sheet underneath. – Spoon filling evenly over dough until covered. – Lift the edge of the cloth and gently roll the dough like a jelly roll. – Once the dough is rolled up into a rope, gently lift it up and place it into a greased loaf pan in the shape of a “U”, with the ends meeting in the middle. Then coil the dough around itself, as this will give the dough its characteristic look when sliced. – Repeat with remaining loaf, coiling the second rope of dough in its own loaf pan. – Brush the top of each loaf with a mixture of 1/4 cup (120 ml) of cold STRONG coffee and 1 tablespoons (30ml/28 gm/1 oz) of sugar. If you prefer, you can also use egg whites in place of this. – Cover pans lightly with plastic wrap and allow to rest for approximately 15 minutes. – Preheat oven to moderate 350°F. – Remove plastic wrap from dough and place into the preheated oven and bake for approximately 15 minutes. – Turn down the oven temperature to slow 300°F and bake for an additional 45 minutes, or until done. – Remove bread from oven and brush with melted butter. – Check the bread at 30 minutes to ensure that the bread is not getting too brown. You may cover the loaves with a sheet of aluminum foil if you need to. – Remove from the oven and allow to cool on a wire rack for 30 minutes, still in the bread pan. Remember, the bread weighs about 2.5 and it needs to be able to hold its own weight, which is difficult when still warm and fresh out of the oven. Allowing it to cool in the pan helps the loaf to hold its shape. – It is recommended that the best way to cut Povitica loaves into slices is by turning the loaf upside down and slicing with a serrated knife. Beautiful job! Your povitica looks amazing, and the swirls turned out really well! I always feel intimidated by the monthly challenges, too, but I am always amazed at what I find I can accomplish. Good job! Thanks so much Jenni!! I loved this month’s challenge. So much fun and so incredibly delicious too! I’ll definitely be making this again some time. Wow, that is a lot of steps! But it’s a gorgeous looking bread that you made there. Worth all the effort, I’m sure! Yes, there’s definitely a lot of steps but that’s just to be thorough. The process itself is not long and the outcome is AMAZING!!! This bread is fabulous! That does look like a lot of work but oh the results…amazing Kate, really. Wow, I don’t know what that stuff is (never heard of it) but I want some now! I love sweet bread – maybe I can borrow some of your courage and make some myself. You should definitely give it a try, Miranda! It was so delicious and not difficult to make. Well worth it!! And I had never heard of it before this month’s challenge either but i really loved it. Great swirls! Nice job on the challenge! My family has been making Povitisa forever. When my Italian family came to America, they met many Croatians in their coal mining village in Iowa. This is where many European immigrants shared their traditional recipes. I hope that you stop by and look at my family’s recipe (under ‘nut bread’, which we’ve always called it due to the inability of small children pronouncing ‘povitisa’. Now following your lovely food blog! Thanks, Roz for your lovely comment! I will definitely go look at your recipe and look forward to trying it. 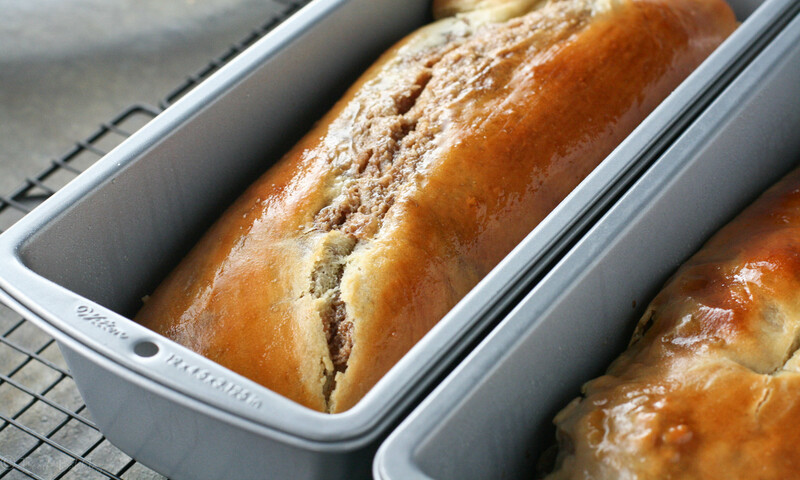 Your loaves look gorgeous – so neat on top as well as lovely and swirly inside! Mine were definitely a bit more rough round the edges, but delicious none the less. It looks amazing, congrats. The original “povitica” comes from my country, Slovenia, and it is called Potica. The filling is actually just walnuts mixed with sugar and raisins, no cinnamon. But of course, there are so many versions of Potica here. I especially love the Poppysees Potica or the Coconut filled. That classic filling sounds like pure perfection, Maja. Coconut sounds like a wonderful filling too! You’ve given me wonderful ideas for the next time I make some. Yum!